Bitdefender QuickScan is a cloud based antivirus scanning service that will in seconds preform comprehensive sweep of most important sections of your operating system, and inform you of found threats. The focus of this software is to very quickly find active threats that hide under the hood of your PC, and very clearly show you where those threats are. This powerful cloud-based service enables you to skip time-consuming and resource-heavy dedicated PC antivirus application, and empower your browser to become window to the limitless processing power of the Bitdefender QuickScan servers. 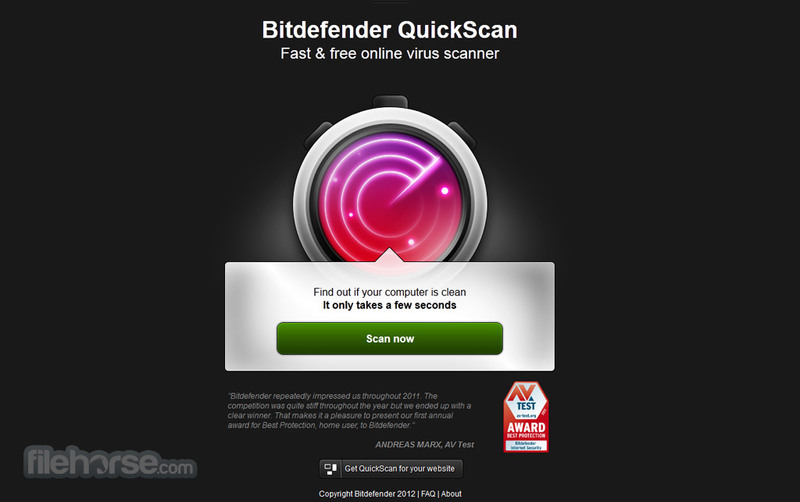 Try this service now and witness why Bitdefender QuickScan is one of the most popular free antivirus-scanning service on the web. Fast. 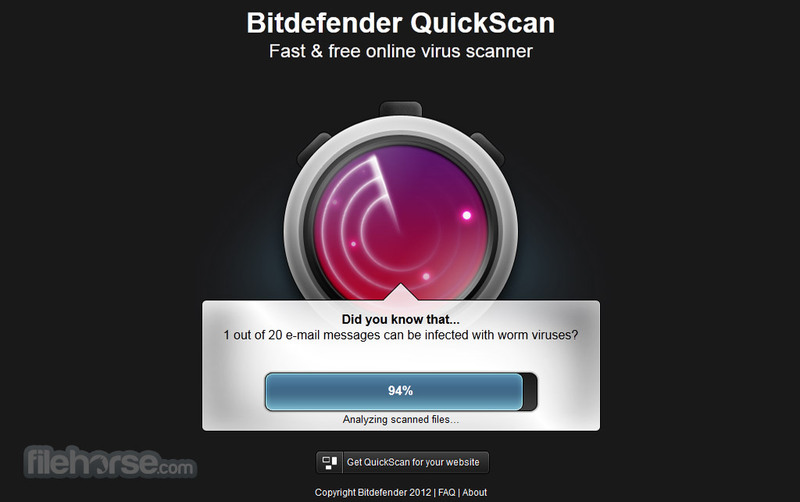 Bitdefender Quickscan runs in the cloud as a lightning-fast virus and spyware detection tool, providing an alternative to the time consuming traditional virus scanners. Light. 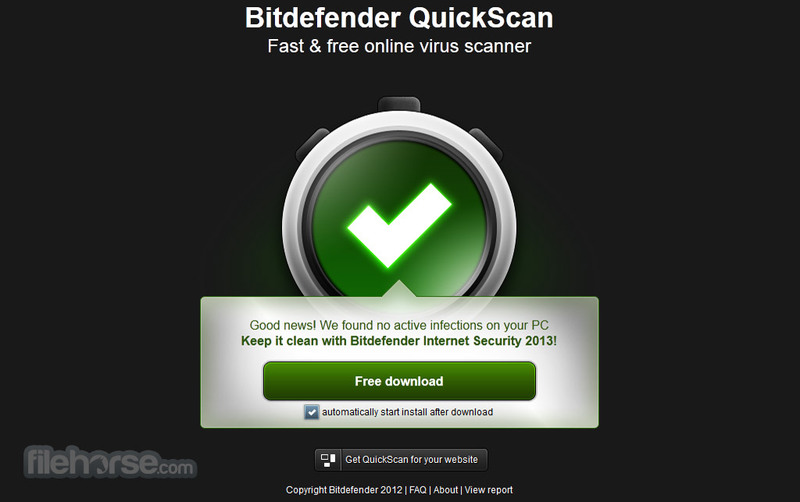 Based on award-winning antivirus Bitdefender technologies, Quickscan detects viruses and spyware without slowing down your PC, as most operations are performed remotely on Bitdefender servers. Easy to use. The Quickscan service can be accessed from any Internet-connected PC. You don't need to install software, perform updates or do any configuration tasks. But if you'd like to use it without visiting Bitdefender QuickScan website, you can also install it as a browser extension or widget. Always up-to-date. There is no need for annoying virus signature updates, as the scanning process takes place directly from remote and powerful servers. QuickScan only detects viruses and spyware which are active in memory or present in files that are run at system startup. Inactive virus bodies are not scanned for and therefore not detected. To run a full system virus scan you can use one of the Bitdefender security solutions. Double-check the security status of your PC even if you already have an antivirus program installed!